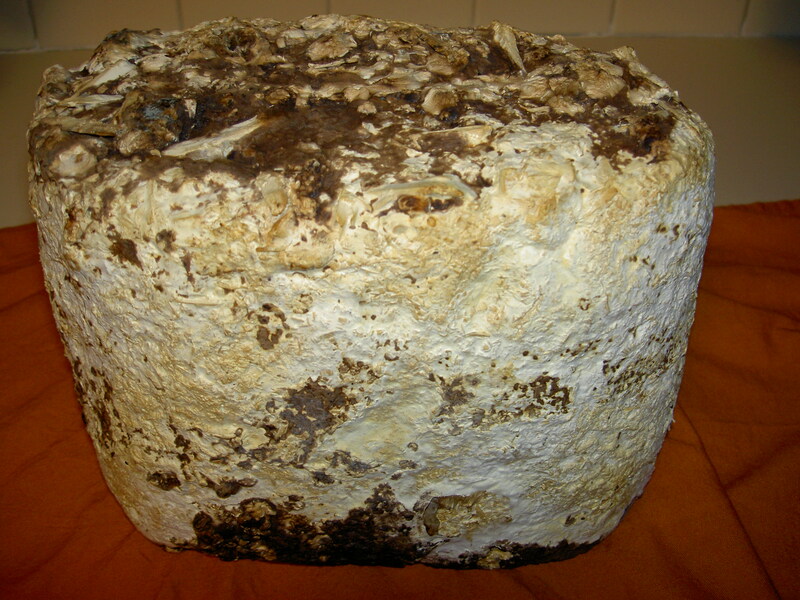 Keith and I bought a shiitake mushroom “kit” through Gardener’s Supply http://www.gardeners.com/ This kit consisted of what looks like a cube of hardened, moldy mashed potatoes and a plastic bag. I was skeptical. I had no idea that, well, fungus needed attention. Doesn’t that sort of thing grow on its own? Anyway, we got about 12 mushrooms in the first “flush.” (Look at me using proper terms like I’ve been doing this a while! Maybe there is hope for me.) A few are still in the fridge. The “kit” is drying out now and we’ll soak it again this weekend for another bout. Kinda cool. I told people we grew our own mushrooms and I got sideways glances – from ALL of them. Yup, growing your own tomatoes and basil is one thing, but once you start saying you grow mushrooms, that just takes it to a whole new level. I remember in junior high school, our teacher, hippie looking guy with long ZZ-TOP fuzzy beard and baggy pants belted with a big belt – you know, the pants were so big that the belt made weird gathers and gaps, he looked silly, I recall it to this day. Can’t remember his name, or what class he taught, I think science, but I remember how funny his big pants looked. Anyway, he told us he grew mushrooms in his basement and sold them to restaurants. I snickered along with the other kids at this weird teacher. Now, here I am, close to (ouch) 25 years later, and I’m thinking that maybe he had something there.